The real M in Generation M: Muslim or Money? You would agree that for a very long time, Islam and Muslims have been seen in one light. With no offence to anyone, media at large worldwide, has painted Islam and Muslims erroneously in a negative light. Fortunately, this mentality is proactively changing. As a believer that community always trumps political agenda, the internet is quickly changing this perception. Social media, the advent of the internet and the rise of mobile have become tools for Muslims to really show the world who they truly are. These tools give Muslims and Islam a voice to showcase their truth. 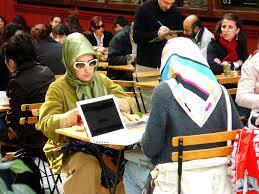 Here comes, Generation M; Young Muslims who are changing the scene gradually. With impeccable taste in fashion and an unquestionable love for the religion, a fusion of style and devotion to the tenets taught by the religion, the world is gradually seeing the religion not only for its beauty but also in the light that you can really have it all. Muslim or money? What is Generation M about? People affect the world in different ways and it is undeniable that in the absence of a purpose, one would feel like they are not making progress in various aspects of their life. Generation M is a revolutionized set of young believers and no, the M is not for money, it stands proudly for the word Muslim! They are millennials with a sweet difference and a mission to change the eyes of the world. They mostly believe that a person’s faith especially with regards to the Islamic religion can thrive and co-exist with modernization and different cultures. The fact that you are a Muslim doesn’t prevent you from looking trendy, full of life and developing deep friendships with people from different cultures (against the beliefs of some who do not understand). The Generation M is an organized, tech savvy, self-aware, religious conscious, trendy and inspired group of people and their goal is to bring more awareness around the world. One of the most notable catalysts for this movement has been the demand for more growth in trading businesses especially for halal food. Notable achievements are being recorded as ground breaking ideas are being made into reality on a daily basis. The amazing people who spearhead this movement are the affluent, young Muslims who are well-travelled and love experiencing food from different cultures. Thus as a result of this, there is the clamour for more Halal restaurants, cafés and increased demand for halal food products in supermarkets all over the world. As mentioned above, the Gen M of today are widely knowledgeable and well-travelled people. They love the religion and are infusing modernization into the very fabric of their beliefs. They love experiencing different cultures from all over the world and one way to do so is through food; eating different types of cuisines and snacks. They want to savour artisan air-dried and slow-cured meat air-flown from Spain or YouTube sensationalized Spicy instant noodles from South Korea or know how original Scottish shortbread biscuits from the U.K tastes different than locally produced ones, all culminating to making the Muslim world globalized. In addition, it is heartening to know that increasingly among Gen M, food sustainability, environmental and social responsibilty have become hot topics. Young, affluent Muslims want to know what they are ingesting and where it is coming from. There is an increased consciousness among Muslims supporting and engaging actively in conversations on food sustainability around free trade, carbon footprint, ethical slaughtering of animals and organic farming. With this elevated consciousness, inevitably, they are health conscious too. Consuming herbal products, health supplements and vitamins, for instance; liquid Omega 3 fish oil, Probiotics, Vitamin D3 capsules to list a few undeniable trends contributing to the Halal Nutraceuticals and Vaccines market to be a US$ 82 Billiom Market by 2026. And... they are not afraid to spend money to indulge in all of the above. With all of these developments, it is apparent that the M in Generation is a deliberate mixture of Money with a greater percentage of what it entails to be a Muslim with a difference. *This guest post was contributed by Founder of OneAgrix, Diana Sabrain. Buy, Sell, Tender & Match on the OneAgrix Marketplace for Must Have Halal Ingredients & Food Powered by Demographics of 2Billion+ Consumers. Are You Ready to Access the Global Halal Super-Highway? To expand your business globally and supply to Generation M, Click on the button below to know how you can tap into his $2.55 trillion Halal industry!